Includes two faces, two airways, six manikin wipes, soft pack, and directions. Soft pack doubles as training mat. 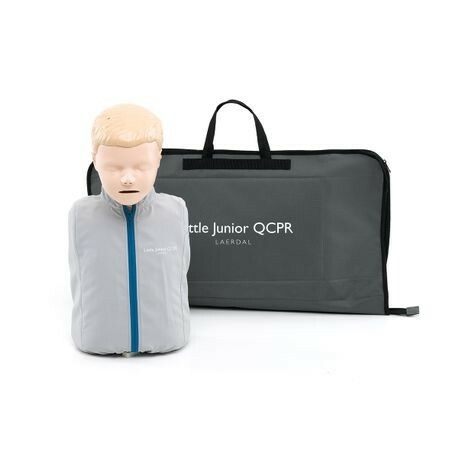 The Little Junior QCPR manikin includes measurement and feedback technology that takes the guesswork out of instruction—all from the palm of your hand. Little Junior QCPR delivers real-time and summative feedback on key parameters of quality CPR using free apps for smartphones and tablets, including the QCPR Instructor App for multiple student monitoring, and the QCPR Learner App for students to monitor their own performance. The SkillGuide with Extension Cable provides a tethered feedback option, and can be used by itself or as a supplement to the apps.